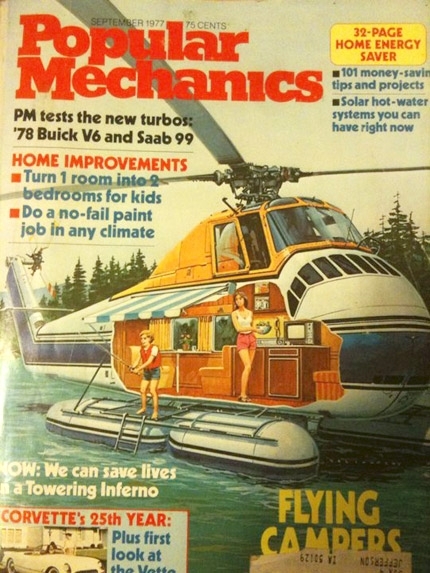 Just wanted to share this awesome cover from Popular Mechanics (also up on the Facebook page). At least one of these campers was created in the 1970’s by Winnebago. Walter has a very similar room, but much cozier right inside his beautiful boxy frame. Just open the side doors, step up and in, and walk thru the door with articulate eyelid – voila! The room used to be where the water tank sat (more details to come in a future post about that), but now it has a table, seats, and radio. At night, the table pulls out and seats pull together for an restful nights sleep.